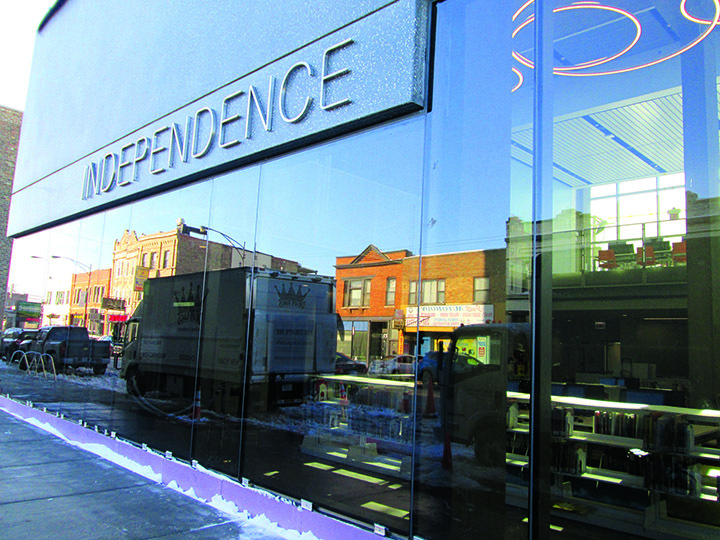 THE INDEPENDENCE Library, 4024 N. Elston Ave., officially opened Jan. 22. Shown above is the front facade of the library on Jan. 21, as final preparations take place before a ribbon-cutting ceremony was scheduled the following day. The library has an open floor plan with natural light, space for meetings or independent study, a graduated seating staircase and a large ground children’s area, according to the city. The Independence Library has been closed since a fire in 2015 damaged its storefront space at 3548 W. Irving Park Road. The Independence Apartments above the library will provide 44 senior apartments, including 30 public housing and 14 affordable apartments, according to the city. The branch was designed by John Ronan Architects.